The Russian domain .RU ranks sixth among global country code domains with the total of 4.93 million registrations. 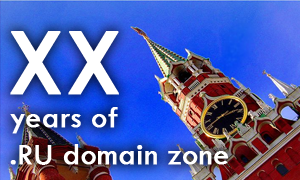 Established 20 years ago, the Russian national domain domain .RU has been steadily growing in the recent years, staying among the world’s most popular domains such as .TK (Tokelau), .DE (Germany), .UK (United Kingdom), .CN (China) and .NL (Netherlands). During the period from November 2010 to March 2014, the Russian Domain Authority reported a monthly growth amount of approximately 15 000 domain names with the monthly growth rate of 0,31 %. The annual growth reported for that period of time was 10,38 %. On average, an Internet user in Russia spends over 100 minutes per day in the .RU zone. Statistics point to general dynamic development of the Internet economy in Russia, which accounts for 8.5% of the country’s GDP. According to the official sources, “as many as 5 million Russians work in Internet-related sectors”. In 2013, more than 80% of investment transactions in the country had to do with the IT sector. The .RU domain continues to grow and is considered by many as “a national asset”. If you are interested in registering a domain name under the .RU extension, please enter the name in the box to check if it is available for registration at this time. Should you have any questions or need assistance, please contact our Support Team at support@web-solutions.eu or via phone on +44 (0) 208 133 3994.